Deluxe location. Deluxe views. Deluxe house. 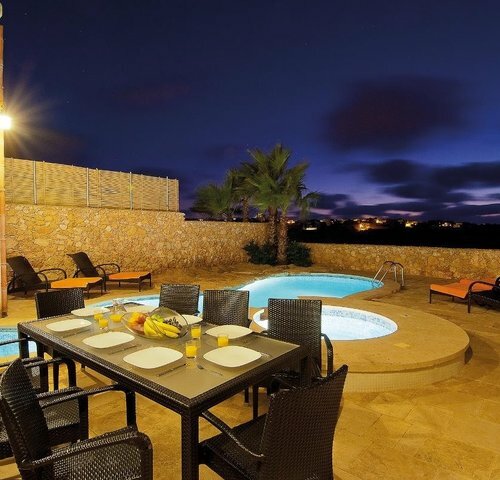 Setting the gold standard for holiday villa accommodation on Gozo discover Hamlet 3 a villa youll find hard to beat - for quality or price - anywhere on Gozo. Hamlet 3 makes a big impact when you first see it. Its (literally) standout feature is the pool. Part outside part in it’s a dramatic focal point and a wonderful feature. Yet that’s not all this Gozo holiday villa has up its sleeve. Hamlet 3 was developed as part of a complex of 5 luxury Gozo holiday homes and the owner has ensured that each has been built with year-round comfort firmly in mind. The under floor heating and log burner make Hamlet 3 as perfect a Gozo getaway in winter as it is in summer. The location with its panoramic valley and countryside views is magnificent all year round too. There’s also a mini-gym and spa shared between the 5 Hamlets. 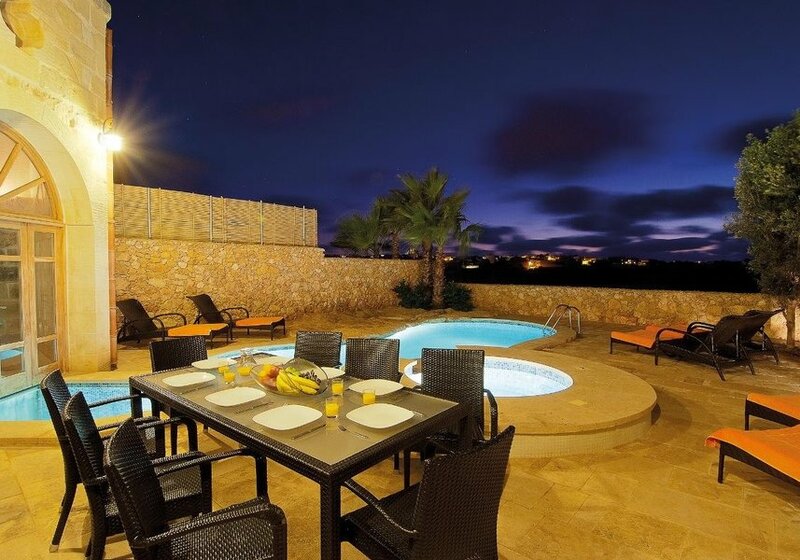 Part home from home part luxury spa part year round escape Hamlet 3 is classy Gozo holiday accommodation you’ll find hard to beat on the island for a similar price. Bedroom 1 is on the ground floor with a double bed en-suite shower room and flat screen TV. You’ll find this Gozo holiday villa’s three additional bedrooms at the top of a stone staircase. Bedroom 2 has a double bed. Bedroom 3 has twin beds. Bedroom 4 has twin beds and a lovely tiled floor throughout. All the bedrooms have en-suite facilities. Step through the front door and you’ll immediately appreciate the brightness of the space a result of lime sandstone and glass doors. The doors ahead lead to the indoor pool which extends to become an outdoor pool through the large arched glass windows. The kitchen is equipped for the most adventurous holiday cook. Double glass doors provide all-round access to the main living area from the pool and reception area. They also mean the lounge is bathed in light throughout the day – great in summer; even more welcome in winter. A flat screen TV with cable DVD player wireless internet and a PlayStation provide plenty of winter distractions – and are welcome summer escapes if the sun gets a bit much. There is an additional WC on the ground floor. A modern family bathroom completes this floor. Terrace doors lead to an extended patio with barbeque. The outdoor pool also has a Jacuzzi. Add the glorious views and the peaceful tranquillity and you might just find that spending the day at your Gozo holiday home is every bit as appealing as heading out to explore. If you take the Victoria-Gharb road to the Aqueduct and fork right you will find the smallest village on the island nestled between the hills of iz-Zebbug and Ghammar. The village of Ghasri sits amongst the fields and valleys of rural Gozo near to Victoria’s commanding Citadel and close to one of the best swimming spots on the island. Worthy of a stop is Tal Gordan a flat topped hill with an iconic lighthouse. At 180 metres above sea level the Lighthouse towers over the village and stands proudly on top of Gurdan Hill. Inaugurated in 1853 the Lighthouse’ beam could be seen as far as 50 kilometres away so affords a fantastic 360 degree view when you get there. It’s a must for ramblers. From Ghasri village square a road leads to the fabulous valley of Wied l-Ghasri 2.3km away from your Gozo holiday farmhouse. The Wied l-Ghasri area is a marvellous place for country walks or rewarding cycle rides especially in winter and spring. The valley ends at the sea wedged between high cliffs where a secluded inlet makes an ideal spot for swimming snorkelling and together with the sea surrounding it a very popular spot for diving. On the way be sure to stop at the charming old chapel dedicated to the patronage of the Blessed Virgin Mary. The two shallow bays of Xwejni and Qbajjar are both 4.1 Km away. Next to each other they have small pebbly beaches and rocky stretches that lead to clear blue water. Excellent for swimming they are enjoyed by locals and visitors alike and are popular with divers especially beginners. You’ll also find a few fishing boats here and a couple of bars and restaurants on the sea front. The feast of Ghasri is celebrated on the first or second Sunday in June and is dedicated to Corpus Christi. Victoria has two big feasts one in the third week of July and the other on 15 August. The closest beaches are just 7 km away and there is also a food store 800 meters from the property. The closest Restaurant is Ta Salvina a 1 km walk. The capital Victoria is 3.5 km away. The 308 bus will bring you to the centre of Victoria where you will find a wide range of shops cafes bars and restaurants - and a wealth of history.